Summary: Lara Jean didn’t expect to really fall for Peter. She and Peter were just pretending. Except suddenly they weren’t. Now Lara Jean is more confused than ever. When another boy from her past returns to her life, Lara Jean’s feelings for him return too. Can a girl be in love with two boys at once? P.S. 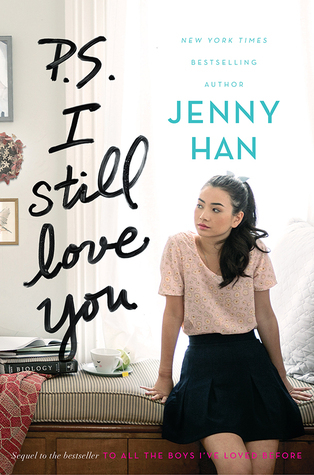 I Still Love You starts out with Lara Jean visiting her extended family — specifically, her Korean side. The little details and all-too-real family dynamics made me love the book from the very beginning. I would totally read an entire book strictly about Lara Jean and her sisters. But, that’s not the main focus of P.S. I Still Love You. As is expected, the main focus is Lara Jean’s blossoming romance with Peter Kavinsky. Their love hits a few bumps in the road — specifically, Lara Jean and Peter’s different expectations for a relationship, and a bout of cyberbullying. Through this plot twist, issues of sexism and sexuality are explored. Lara Jean’s own maturation can be seen throughout the novel. For the most part, these issues are handled well, though I wish there could have been a little less of the girl-vs-girl / mean girls aspect of the novel. What made me truly fall in love with this book wasn’t the romance, but the language, the little asides that made the story come to life — like when Lara Jean’s sister “hot-potatoes the phone” to Lara Jean, or when Lara Jean tries to telepathically tell everyone that she and her boyfriend’s relationship is slowly simmering, that “WE ARE BRISKET.” These sentences were everything. Also, the cover — it’s gorgeous! I could look at it forever. If you want a cute, heartwarming romance, check out P.S. I Still Love You! Recommendation: Get it soon! This is an adorable sequel to To All The Boys I’ve Loved Before. I am about halfway through this book, and I am totally in love with it. My favorite exchange so far is with the sisters talking to Kitty about The Sopranos. LOVE.